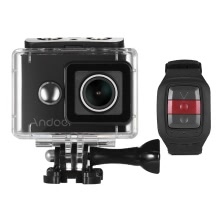 Andoer An8000 action camera adopts for Ambarella A12 DSP, for Sony IMX117 12MP COMS sensor and 155°wide angle lens, ensuring full HD and extra smooth picture quality. The multiple shooting/photography modes offer you wonderful shooting experience. Comes with a remote control, 30m waterproof housing. It can be fully charged in 1h. Adopt for Ambarella A12, for Sony IMX117 12MP COMS sensor & 155° 7 layer glasses HD lens, best in its class. Support 4K/30fps 1080P/120fps 720P/240fps full HD video recording & max. 16MP photography, 2.0" HD LCD screen offer instant playback. Support Time Lapse Video/Loop Recording/Car DVR/Motion Detection/Quick Capture, and Long Exposure/Self Timer/Burst Photo/Time Lapse Photo. You can trigger shooting via the 2.4G remote control(within 10m). Connect to smartphone via WiFi, you can achieve real-time share with the world. Comes with a waterproof case, can go underwater 30m. Powered by 3.8V 1000mAh detachable battery, full charge can be finished in 1h, quicker than ever. Unique patented outlook design, with comfortable texture. Ideal for recording outdoor extreme activities, comes with multiple mounting base. 1. Should you could not turn on/charge the camera, please check if there is a plastic sticker on the battery. Remove it and try again. 2. Short press power button to enter video setup, then hold the shutter button(2s) to enter set up. 3. Hold the shutter button(2s) to exchange between video/photo/playback. 4. Power button — exist, shutter button — yes. Connection: Micro USB / HD Out. Item Size: 6.2 * 4.2 * 2.2cm / 2.4 * 1.7 * 0.9"
Package Size: 22.3 * 13.1 * 6.5cm / 8.8 * 5.2 * 2.6"
Micro memory card is not included. And in order to ensure the smoothness of camera operation, class 10 or above is highly recommended.